The Irish Draught Horse is so rare that Purebred Irish Draught Stallion owners have a tremendous responsibility to preserve all that is great about the breed. His conformation, movement and athleticism along with how he is inspected, campaigned and promoted, all has direct and exponential influence over possible generation loss. This means that an incorrect stallion that is heavily promoted and chosen simply for low stud fees or geographic proximity can significantly detriment the quality of the breed itself for many future generations. For this reason, we at BenMar Farm have been extremely careful with the choice of our Purebred Registered Irish Draught Stallion, BenMar’s Bridon Belfrey, RID. Belfrey is the complete package. He has arresting beauty, presence, conformation, athleticism, and rare black color. Belfrey enchants with his exceptional temperament. He is conformationally correct and specific to breed type. 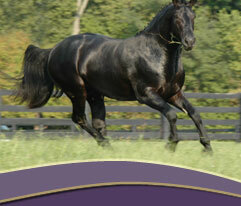 Belfrey has dressage-type, up-hill movement that is always in perfect balance, rhythm and self-carriage. Belfrey is synonymous with Presence and Athleticism. BenMar’s Bridon Belfrey, RID promises to be an upper level performer, able to proudly represent our special breed. Most importantly, Belfrey has proven to be a “very dominant sire” stamping his offspring with his great looks and athletic ability.